February 1/12 17:14 pm - Prospera Valley GranFondo & Kwantlen First Nation want you to VOTE! The inaugural Prospera Valley GranFondo will take place on July 22, 2012 in the scenic Fraser Valley of British Columbia and is certain to become one of Canada’s premier GranFondo cycling events. As participants cross the finish line in Fort Langley, they will receive a Finisher’s Medal showcasing a unique First Nations’ design. “We are pleased to recognize the artists of Kwantlen First Nation and are honoured to have their artistry symbolize the accomplishment of our riders” says Jeffrey Hansen-Carlson, General Manager, Canadian Velo Event Management Society. The Finisher’s Medal art contest is presented by the Prospera Valley GranFondo and the people of the Kwantlen First Nation. 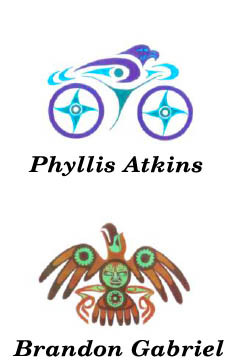 The goal is to combine First Nations artwork with the theme of cycling. The winning artist will receive a $1000 award from Canadian Velo Event Management Society, presenters of the Prospera Valley GranFondo. The contest has been narrowed down to two final images and the public is invited to help select the winning design that will be incorporated into the Finisher’s Medal. The original images can be viewed at the Fort Langley National Historic Site in Fort Langley, BC until February 29th. Vote online at www.ValleyGranFondo.com.